Summary: All special effects and little else besides might make The Day After Tomorrow a typical disaster film - but that in itself isn’t too much of a disaster. Forget all that you have heard about The Day After Tomorrow’s dubious scientific basis. That the drastic climatological changes the film is based around could never happen is of no concern. This, after all, is a disaster film. As such, it’s supposed to present an incredibly outlandish situation that no one in their right mind would wish to experience. Who, after all, would go to see a fictional film that accurately represents the intricacies of climate change? Would you spend your hard-earned cash on a movie that had the tagline: ‘The average rainfall has risen by 0.3% over five years. Only one man can warn the world. That man is…Fish. Michael Fish’? Of course not. We don’t want hard facts. We want to see huge icebergs breaking off. We want to witness LA getting ripped apart by three enormous hurricanes (even if, this, yawn, negates the laws of physics). We want to see what happens when Manhattan gets a wee bit damp thanks to a massive tidal wave, and then gets as cold as the looks between Jordan and Victoria Beckham. In short, we want to see a motherload of totally unscientific climatological catastrophes. And on this (cold) front, The Day After Tomorrow certainly delivers. Then again, releasing a disaster film in 2004 that isn’t littered with amazing special effects would be cinematic suicide. So the fact that The Day After Tomorrow has a series of shots that look incredible, is really a given. And if this is enough to bring audiences flocking in, then fair enough. However, those unimpressed with CGI trickery who expect a bit more substance to their films might want to approach this latest blockbuster with caution. Because if you take away the special effects budget from The Day After Tomorrow, you’re not left with all that much. For starters, the film’s narrative is fairly static: climatologist Jack Hall (Dennis Quaid) tries to warn the world of impending disaster, no-one listens, disaster “pends”, the Northern Hemisphere ends up a certain creek without a certain paddle, but the fate of Europe et al is neglected in favour of Jack’s efforts trying to save his son Sam (Jake Gyllenhaal), who’s stuck in the Manhattan Public Library and getting just a little bit nippy. In terms of characterisation, Dennis Quaid is, at times, a little out of his depth as the climatologist who tries to warn the world about impending disaster. He walks around the first half of the film looking pretty miffed, but whether this is because his warnings are going unheeded, or because he is having great difficulty pronouncing phrases like ‘climatological data analysis’, is not properly explained. He does, however, do much better in the films latter half when he gets to be heroic and engage in a bit of good ol’ American father-son bonding in the bargain. As Sam, Jake Gyllenhaal doesn’t come out too badly in this, his first big feature film, primarily because his skills as an actor allow him to rise above his material. But, having grown up a bit since Donnie Darko, he does looks fairly unconvincing as a 17-year-old school boy (he is, after all, 24). Given the controversial subject matter of the film, there are some nicely satirical moments, such as when Americans fleeing from destruction are only allowed over the Mexican border once the President cancels Third World Debt. But in general, the film’s narrative and script are not strong enough to stop attention from wandering when scenes of destruction by wind, water and ice are absent from the screen. However, as most people will be going to see The Day After Tomorrow for exactly these kinds of scenes, it is unlikely that they will be particularly disappointed when the other areas of the film fail to deliver. 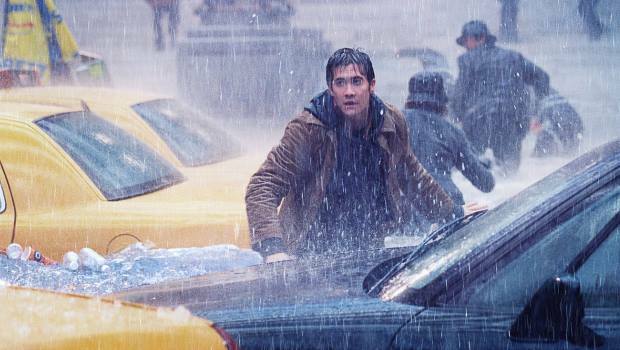 All special effects and little else besides might make The Day After Tomorrow a typical disaster film – but that in itself isn’t too much of a disaster.